Randy Moss is back in football. 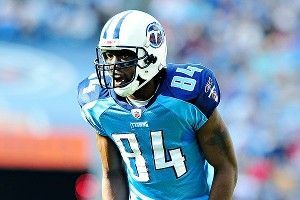 The 35-year-old receiver signed a one-year deal with the 49ers after working out for Jim Harbaugh. Sources reported that the workout went really well, except for an awkward moment near the end when Harbaugh shoved Moss to the ground while shaking hands, and Moss responded by aggressively mooning him. Tiger Woods has a mild strain in his Achilles tendon, but still hopes to play next week at Bay Hill in preparation for the Masters. Since it would be redundant to call the injury Woods’s “Achilles heel,” headline writers are currently looking for a phrase that means “vulnerable point” or “weak spot.” If you have any ideas, definitely let them know. Saints owner Tom Benson and head coach Sean Peyton met with NFL commissioner Roger Goodell to discuss the bounty system run by former defensive coordinator Gregg Williams. During the meeting, Benson and Peyton both fell victim to Goodell’s own bounty system, where he pays secretaries to “accidentally” spill coffee on his visitors. Sources indicate that the Orlando Magic are pushing to acquire a “difference maker” that might convince Dwight Howard to make a long-term commitment to the team. Failing that, they hope to sign a “hilarious sidekick” for Howard, a fat white guy along the lines of Jim Belushi or Kevin James. The women’s NCAA field is set, with undefeated Baylor earning the top overall seed. The Bears, of course, are led by Roberta Griffkin III, a lightning-quick guard who speaks in a falsetto voice, wears comical floral print dresses, and always insists that she’s a woman for no apparent reason. The NCAA finally reached a verdict on the North Carolina football scandal, banning the Tar Heels from the 2012 postseason and penalizing them 15 scholarships over three years. When the news came out, distraught Carolina players immediately called their agents for advice and then tweeted it out. President Barack Obama will be taking British Prime Minister David Cameron to Tuesday night’s First Four game in Dayton, Ohio, between Mississippi Valley State and Western Kentucky. According to sources, Obama is trying to prove that in extreme circumstances, basketball can be more boring than soccer. Cameron, for his part, is expected to declare war on the United States early in the second half.